I once heard Ronnie Drew of The Dubliners remark that "some people think you should be 100 years old and live on the top of a mountain before you could sing a Folk Song". To judge by the sale of The Dubliners' recordings this idea has now been well and truly scotched. No one has prescriptive rights in this field of music, no more than in any other. Folk Songs — or Ballads as we prefer to call them in Ireland — are common property. There is nothing to stop a city man singing a country ballad or vice versa — as long as he sings with sincerity and with his natural accent. I think that this is one of the main reasons for The Dubliners' success. This record, however, is not by The Dubliners. It is by three sisters from the town of Boyle in the Co. Roscommon. 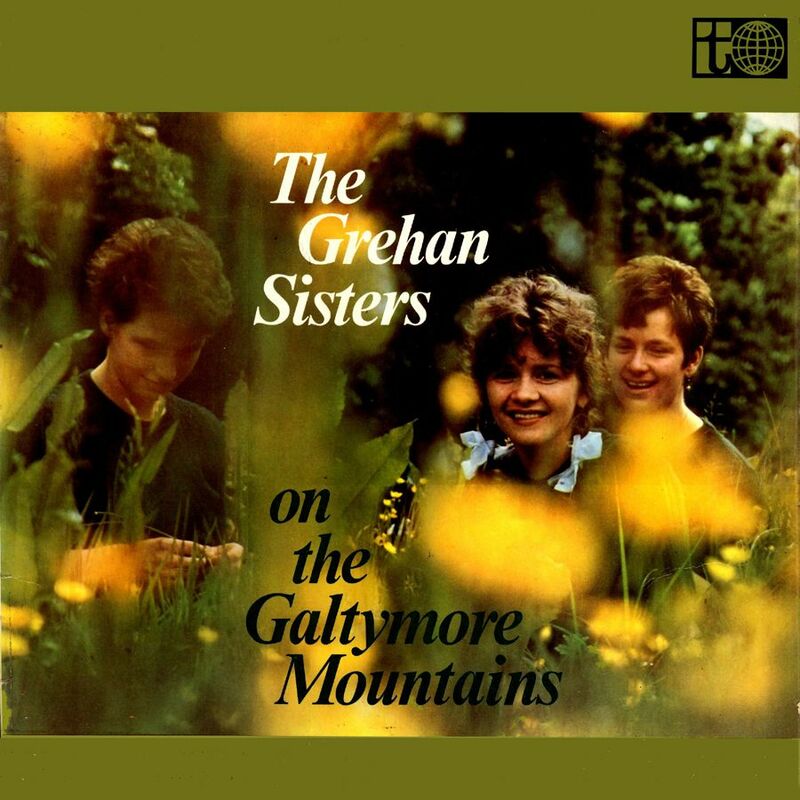 They sing with the utmost sincerity and their accent is as redolent of their native place as "drisheen" is of Cork. They sing and play lustily and with obvious enjoyment. After they had recorded the four numbers on this record, and two more for good measure, they proceeded to O'Donoghue's Pub in Merrion Row to regale the happy throng in the Mecca of ballad singers. They were so fresh as if they hadn't sung a note all day. The rest of us, including Joe Heaney, just three lovely lassies from Boyle, who now and then slaked their thirst with orange squash. THE GREHAN SISTERS are on their way as recording artists. As ballad singers they arrived a long time ago, when they first started to sing in their father's pub in Boyle. Aged 16, 20 and 21 they hold an excellent chance of one day aspiring to the position of Ireland's No. l Ballad Group. We dedicate this LP with thanks to Jeff and Des; and, since, to the memory of Jeff. 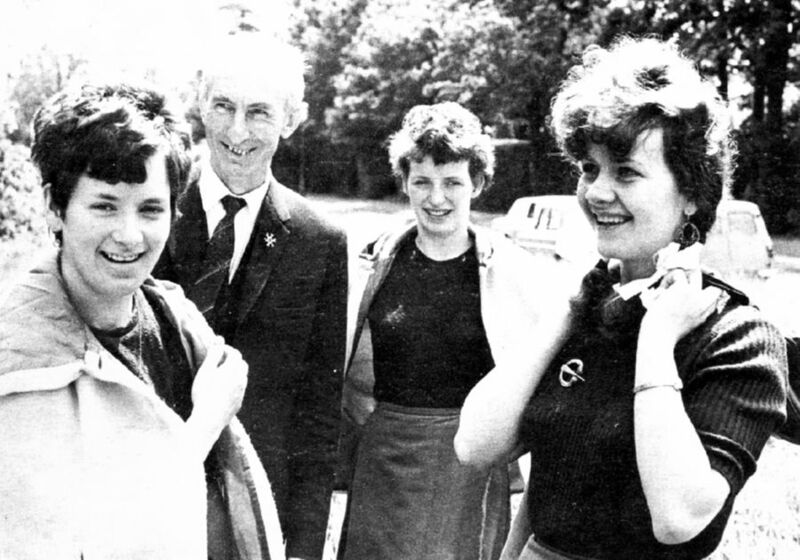 The Grehan Sisters, Marie, Francie and Bernie come from Boyle in County Roscommon. Marie is 23 years old, Francie 22 and Bernie 18. Their parents own a pub 'Grehans Bar' in Boyle and the sisters started their folk singing career by entertaining the customers in the bar. Francie is the main instrumentalist and what an instrumentalist! At the age of 15 she came second in the miscellaneous instruments section of the All Ireland Fleadh, beaten by the winner by one mark and after that she was placed first or second in four other All Ireland Fleadhs. Bernie plays guitar and is also a phenomenal spoons player, Marie also plays the spoons and is the main vocal strength of the group. 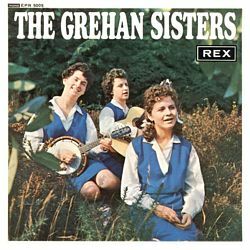 For about two years The Grehans established a reputation singing and playing professionally around the Dublin area. Early in 1967 they came to stay in England and ate now based in Manchester where they arc building up a tremendous following, appearing at folk clubs and concerts and also on radio and television. In both their material and their presentation. 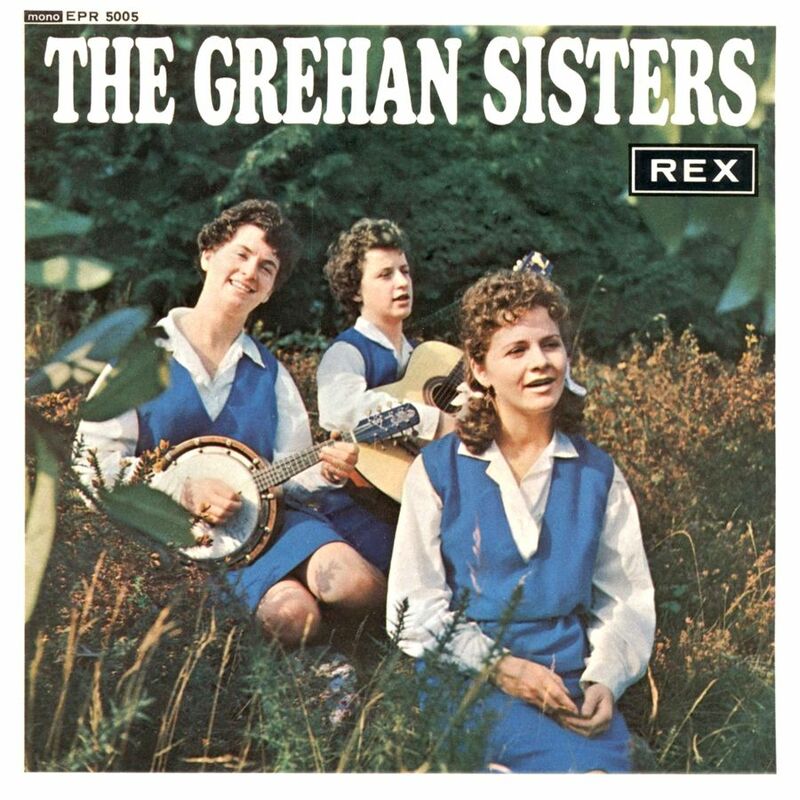 The Grehan Sisters are one hundred percent genuine.There is none of the false slickness of the city performer who adopts folk music second hand. The Grehans have lived and grown up with their material and they have too much respect for it to try and gloss it over with surplus trappings. They are natural singers, natural performers and natural musicians and their feeling and enthusiasm for their music is infectious. Under the circumstances we'll go so far as to say that they are also likely to be naturally successful — and we think that you'll agree when you've heard this record. Victoria. The decapitation of King Billy's statue in College Green, Dublin, the blowing up of the Equestrian Statue of King George II in St. Stephen's Green and the removal by violent action of the Lion and Unicorn emblem near Dublin Castle on the morning of Poppy Day 1937, set loyal people saying that means should be taken to protect the ugly and aggressive looking image of the Queen Victoria that stands on Leinster Lawn. On the Galtymore Mountains. The Galtymore Mountains stand just south of Tipperary in County Tipperary and County Limerick. The song is a beautiful ballad expressing a young girl's deep love for her country and her willingness to die for it. The Jigs Gallagher's Frolics and the Leitrim Jig show off Francie's virtuosity on the ukulele banjo and Bernie's on the spoons. The Lake of Coolfin is a traditional ballad also known as The Ballad of Willie Leonard'. It is a song which The Grehans have been singing since they were knee high. They say that they have never heard it sung anywhere other than the West of Ireland. The Fairy Boy. This is a traditional ballad which The Grehans learned from Their Mother who does not sing but who used to recite 'The Fairy Boy' as a poem. The story was probably based on an old tradition that prevailed in Ireland many years ago. When a beautiful child died, a mother believed that the original child had been taken by the fairies and a sickly elf left in its place. Some mothers used to dress their little boys in frocks to fool the fairies. This tradition is still carried out in many parts of Ireland. The Black Velvet Band. The Grehans learned this song about three years ago when they got the words from Fergus Cahill, a friend of theirs. The story is about a young man who is beguiled by the beauty and charm of a girl who plants a theft on him for which he is transported to Van Diemans Land. In those days people were transported for very trivial reasons. Lonely Banna Strand. Banna Strand is in South West Ireland and the ballad tells of the capture of Sir Roger Casement on his arrival from Germany, his journey to the Tower of London, his trial and death and the taking of his remains back to Ireland in 1965 to lie with the rest of his 191 G comrades. My Uncle's in the Dail. The Grehans heard this song sung at various concerts throughout the country but could never find out the name of the actual composer. They eventually got the words from a friend in Sligo. Tommy McDonagh. This ballad was written by a man called Patrick McGrath who lives just outside the town of Boyle, County Roscommon. The story is of a young lad named Tommy McDonagh who was shot by the Tans in 1921 during an attempted raid on the barracks in Castlerea which was occupied by the Tans. McDonagh's mother and his fiancee were forced to drag his corpse through the streets of Castlerea as a warning to the rest of the Irish. McDonagh who was only twenty one years old came from a place called Cloonlo which is a bout six miles from Boyle. This song is a great favourite in Roscommon. The Donegal Reel has Francie again on ukulele banjo with Packie Byrne on whistle and Bernie on spoons. The Wexford Massacre was written in 1649 by M. J. Barry. It is a beautiful and pathetic ballad with an equally beautiful air and tells of the mass murder of innocent men, women and children carried out by the hated Cromwell in the town and county of Wexford. Thanks to Michael O'Farrell for supplying all of the above information.